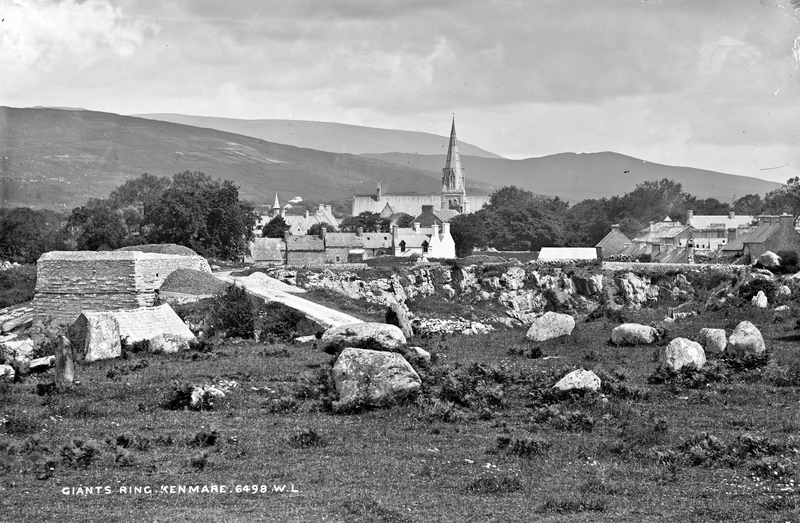 To the Lawrence Collection this morning and to "The Giants Ring", Kenmare, Co. Kerry. It is not easy to pick it out due to the more modern construction dominating the foreground but there appears to be a ring of ancient stones as the feature? Holy Cross church no help, dates from 1863. Likewise the Poor Clare's convent with its cupola. I think these houses from 1874 are present, and these ones from 1880 are not. Certainly after 1874, those 1880 ones are a bit less certain. The circle itself is unfortunately a bit too old to help with dating the photograph, being between 3000 and 4000 years old (approx!). Though I've visited this stone circle many times, it seems almost unrecognisable here. The current "garden" feel (as evidenced by the various photospheres) seems so different from the karst feel in this Lawrence shot. I never even realised there was a quarry or kiln nearby. Thanks all - [https://www.flickr.com/photos/[email protected]] for confirmation of location, and [https://www.flickr.com/photos/gnmcauley] in particlular for the input on the date. Much appreciated. Have a great weekend all!